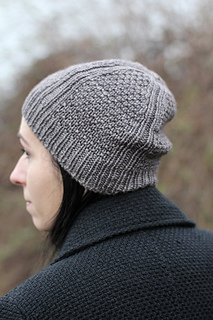 Hideaway Hat begins with an optional tubular cast on and a wide band of 1x1 rib. 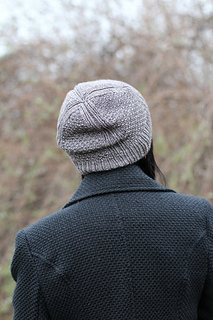 The body of the hat is worked in an easy to work textured stitch pattern: the panels of the Dot Stitch pattern are divided by ribbed columns. 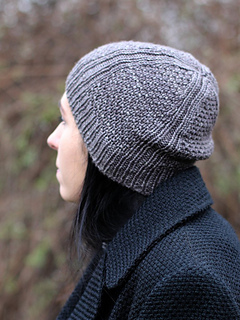 The crown shaping is integrated into the stitch pattern. 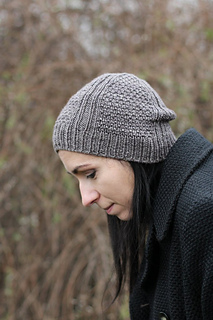 Hideaway Hat can be a good choice for men and women who prefer simplicity. 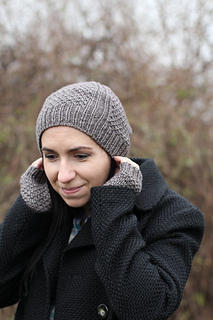 The stitch pattern creates a deep texture and it looks good in dark colours. 36.5 (41: 45.5: 50: 54.5: 59) cm / 14½ (16¼: 18: 19¾: 21½: 23¼) inches circumference at widest point, 16.5 (18.5: 20.5: 22.5: 24: 25.5) cm / 6½ (7¼: 8¼: 9: 9½: 10) inches height, unstretched. The sample is a size Adult S, shown on a 55 cm / 21½ inches head. Approximately 64 (80: 100: 125: 135: 150) m/70 (88: 110: 135: 150: 165) y. Sample made with The Plucky Knitter Traveler Aran (65% Merino-20% Silk-15% Yak, 201 m/220 y per skein) in colourway Fisherman’s Wharf.